Looking for the best XQD memory cards for Nikon Z6 and Nikon Z7 mirrorless cameras? Here are our top recommended XQD Memory Cards for Nikon Z6 & Z7. Both Nikon Z6 and Nikon Z7 mirrorless cameras come with only one XQD card slot that supports XQD 2.0 and 1.0 cards. With its speed up to 400MB/s, the XQD card is the fastest memory card in the world, no other memory cards can beat the QXD cards at the time of writing. But when it comes to XQD cards, the choices are very limited. Offering up to 440 MB/s read speeds and up to 400 MB/s write speeds, the Sony G Series XQD cards are the best choice and most favorite among professional photographers, allowing it to record 4K video and up to 200 continuous raw still image bursts. The affordable Lexar 2933x XQD 2.0 memory card is the second best XQD card after the Sony (up to 128GB capacity only), but it is now discontinued, and it is hard to find it in stock anywhere. In addition, the Delkin Devices Premium XQD card features read speeds of up to 440 MB/s and write speeds of up to 400 MB/s – another great XQD card for Nikon Z6 and Nikon Z7 mirrorless cameras. 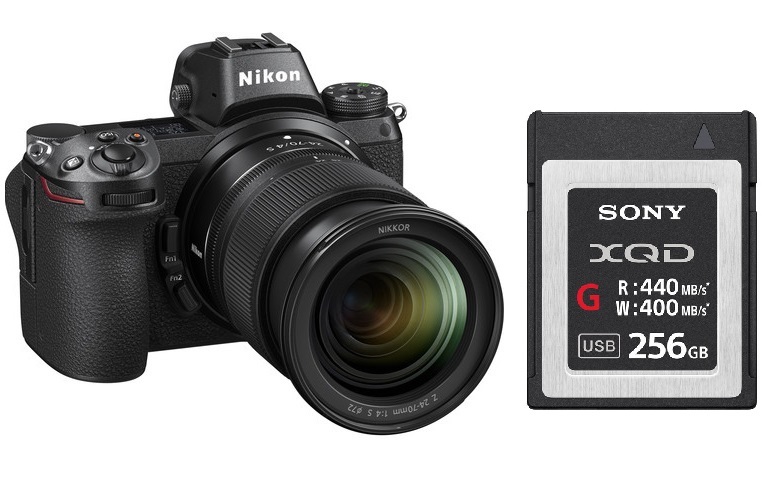 Here is our list of top recommended XQD memory cards for Nikon Z6 and Nikon Z7 mirrorless cameras.